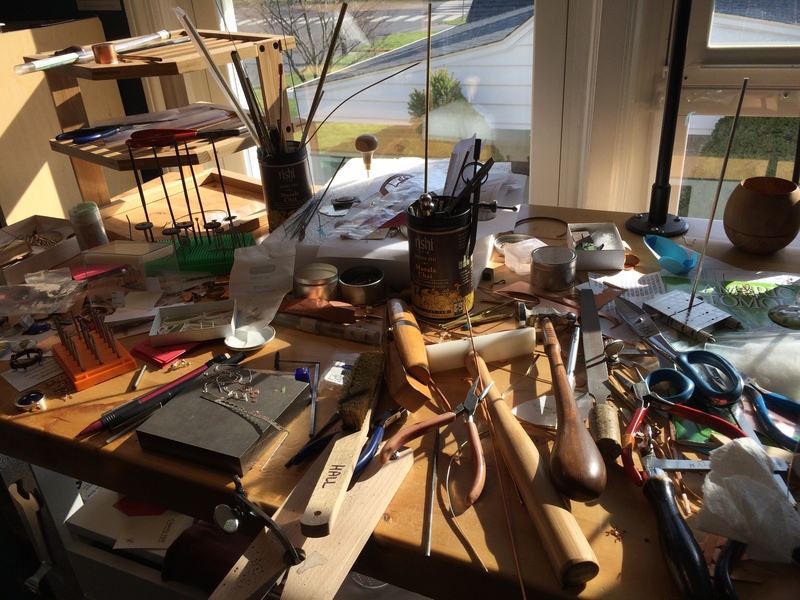 Handmade is a process, differing greatly from ‘hand assembled.’ Instead of relying on machinery, products, and components, the artist assumes control over the entire operation. Consider Play Dough (product) vs. flour, salt, and water (ingredients); I create from ingredients rather than manipulate the product. My ingredients are raw: wire, sheet metal, and powdered glass. Shown above is my workbench on a typical busy day. Included are a handful of the hundreds of tools I use to create my work. 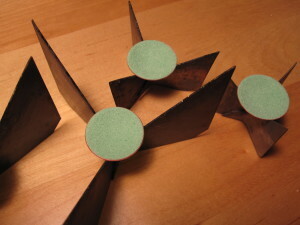 Perhaps the most useful is the humble jeweler’s saw, a manual handsaw with a blade so fine that it can be difficult to see the individual teeth. Another essential is my torch, which I use for soldering, annealing, and occasionally for firing enamels. A dozen types of hammers, steel mandrels, and an anvil round out my shop. 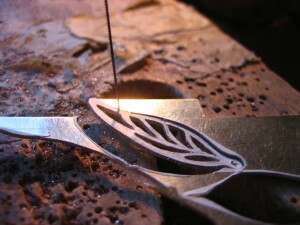 An earring in the process of being sawn by hand. To reduce my environmental footprint, nearly all of the sterling silver used in my shop is from recycled source as opposed to newly mined silver. As I work, I collect even the tiniest bits of scrap silver (cutoffs, filings, etc.). 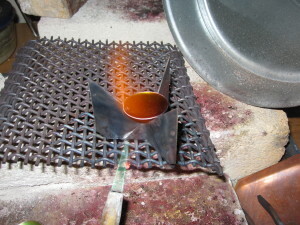 I melt the scrap in a crucible, pour into a mold to make an ingot, and forge the ingot on an anvil. I continue by rolling the ingot in a steel rolling mill to get the desired thickness of ‘new’ sheet metal. 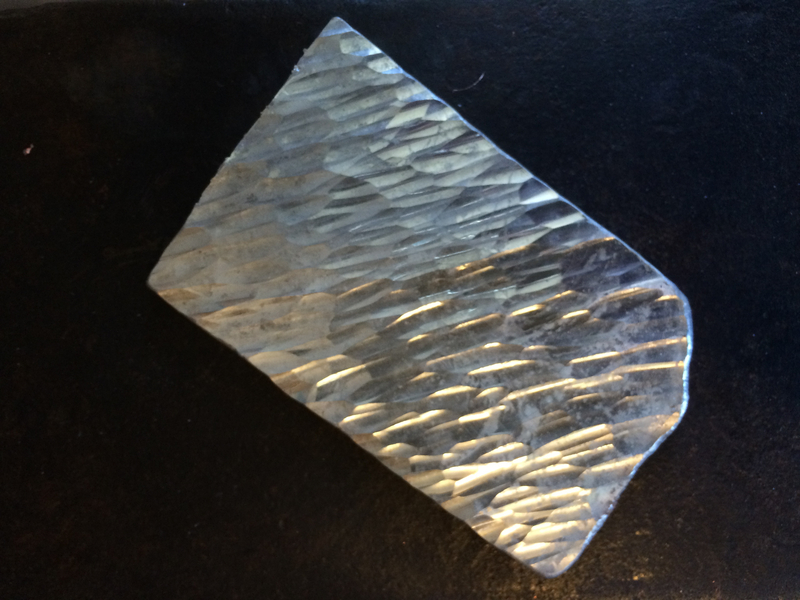 When I do purchase ‘new’ silver, I buy from a Virginia-based company that is committed to sustainability, selling only refined metals from 100% recycled sources. Whether makers or consumers, we all share the burden of environmental responsibility. 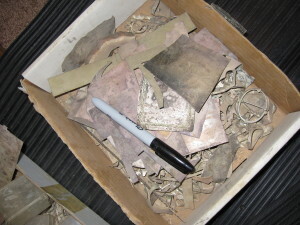 A box of heavily tarnished scrap silver purchased from a retired jeweler. The larger pieces will be cleaned and used as they are, while smaller cutoffs will be melted down into a new ingot. An ingot in the process of being forged on the anvil. After forging, the ingot will be rolled into the desired thickness of silver sheet. In lieu of diamonds, I use a variety of synthetic and naturally occurring gemstones. I boycott diamonds because of the severe social ramifications associated with the diamond trade. For years, diamonds have been mined in war zones and used to finance violence. Even conflict-free diamonds may or may not be what they are intended to be, and it is impossible to tell if an individual diamond is truly clean. As with diamonds, there are also social and environmental consequences related to some of the rarer natural gemstones. But there are synthetic stones that are chemically and structurally identical to naturally occurring stones. Look closely and you will find lab-grown sapphires, lab-grown rubies, and cubic zirconia in my otherwise traditional stone settings. They provide just as much light and color, but without propagating international violence and destruction. 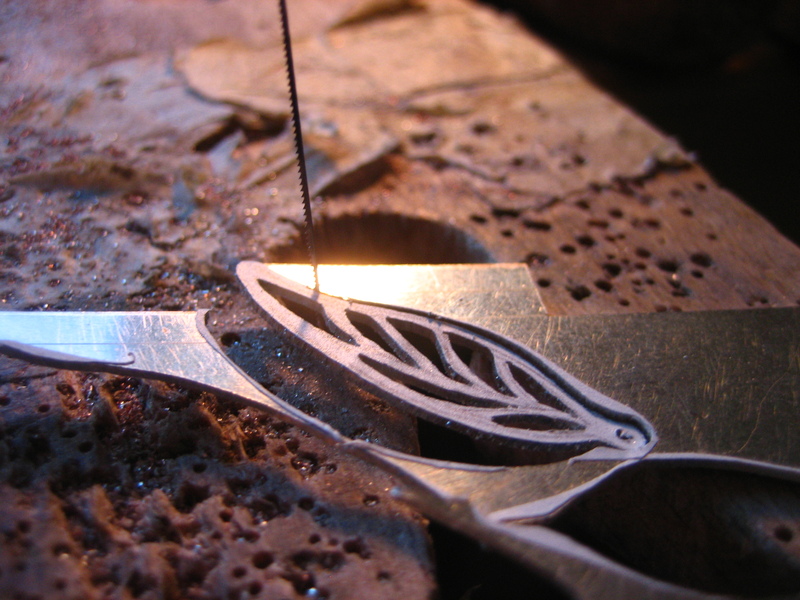 True value lies within the handmade process and design, not in the commercial materialism of the finished piece.